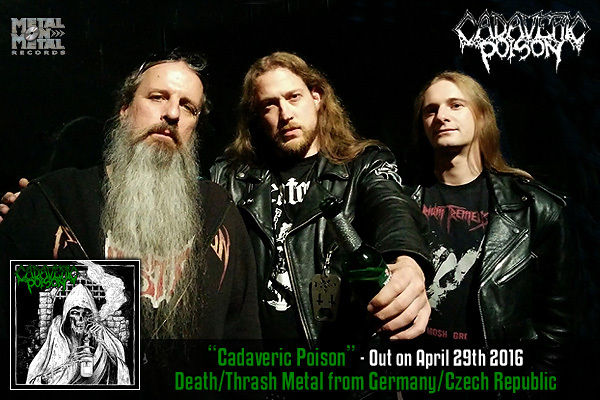 CADAVERIC POISON is a new death/thrash project of three veterans of the scene: Simon Seegel, Felix Darnieder (both of the German thrash institution WITCHBURNER) and Paul Speckmann who has cut his teeth on playing in MASTER, ABOMINATION, DEATH STRIKE and several other bands. Not surprisingly, their self-titled debut will bring to your mind Paul's bands, as his harsh and visceral vocals are very personal and instantly recognizable, unlike those of hundreds of other death metal growlers. He spits, belches and bellows out his socio-politically charged lyrics with genuine ire, while the song writing and solid instrumentation, spiced up with awesome solos courtesy of guest guitarist Michael Frank (WITCHBURNER), by the German thrashers is just as convincing. This album will take you back to the time when death metal was just emerging as a genre and often had some thrash metal elements. The simple but effective riffs and insanely catchy rhythms make these songs highly headbanging-inducing. This is a true old school death metal manifesto! It was 2013 when an idea to start an old school death metal project began forming in Simon Seegel's head. 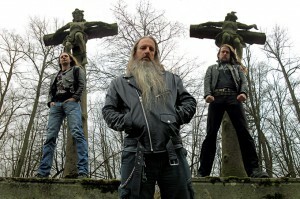 Simon, who had been the guitarist of WITCHBURNER since 1996, played on all releases of this respected German thrash metal band, including seven full-length albums, several EPs and splits. He then asked his band mate Felix Darnieder (WITCHBURNER drummer since 2002) if he'd like to join him, to which Felix agreed, and soon the song writing commenced. After a few weeks, the first song, later called "Fight for Evil", was recorded in the rehearsal room in its rough demo version (just guitar and drums). At this point Simon and Felix had already been in contact with a veteran of the death metal scene Paul Speckmann (MASTER, ABOMINATION, DEATH STRIKE and many others) thanks to a personal trade. They asked Paul if he'd be interested in the project, and he asked them to send him some riffs. He liked the demo, so they started talking about the next steps, which included writing another track and releasing an EP. When the second song was finished and Paul was working on the lyrics, Seegel created the name CADAVERIC POISON. The recordings for the EP were done in March 2014. Titled "Fight for Evil", and featuring also "Violence Breeds Violence", the EP was released on vinyl as 7'' by Dying Victims Productions in July of the same year. The first manifestation of this German/Czech project was met with very good reactions in the worldwide underground. The next step was writing the full-length album. The instruments were recorded in the summer of 2015 and the vocals finished in the beginning of 2016. Still in 2015 Simon asked Jowita from Metal on Metal Records (who painted cover arts for the last four WITCHBURNER albums) if she would be interested in putting out CADAVERIC POISON's debut. The label was not known for releasing death metal, but both owners have been into old school death metal personally, so after hearing the EP, they said "yes" without hesitation. CADAVERIC POISON's self-titled debut album is a true old school death metal manifesto - it will take you back to the time when the genre was just emerging and often had some thrash metal elements. Paul's insane vocals are instantly recognizable, and the solid instrumentation by the German thrash veterans is just as convincing. This rabid beast will be unleashed on April 29th 2016... watch out!